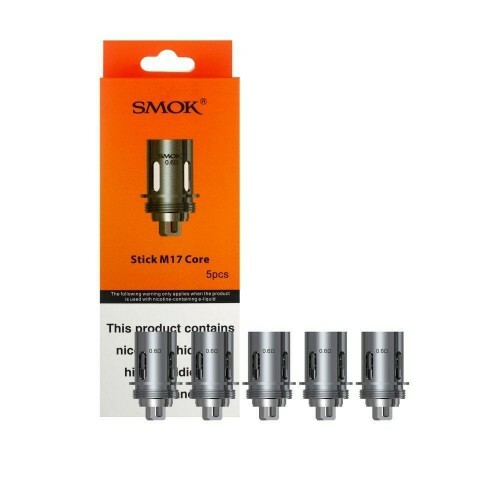 These M17 coils are for use with the SMOK Stick M17 only. M17 coils have a dual coil design, a resistance of 0.6ohm and deliver a smooth, flavour-filled vape. To change your coil, simply turn the kit upside down, remove the tank section and unscrew the coil, then replace with a new one. M17 Coils come in packs of 5. SMOK TFV8 V8 BABY MESH REPLACEMENT COILSFeaturesResistance: 0.15ΩMesh Heating ElementRecommended Wa..
TFV8 BABY M2 COILSThe Smok Baby-M2 coil heads are for use with the Smok TFV8 Baby Beast, Big Baby a..
SMOK PRIV V8 KITThe new SMOK Priv V8 Kit consists of a Priv V8 MOD and a TFV8 Baby tank. The fashio..
CBDFX CREAM 50ML 150MGThe CBDfx pain cream is pharmacist-formulated and made in America. With a com..